Contemporary composers with a range of musical styles and interests have been commissioned to produce new pieces for Sarah Kenchington’s Wind Pipes for Edinburgh, an extraordinary new musical instrument created from almost 200 decommissioned organ pipes and installed in Trinity Apse, a 15th Century Kirk. The final concert on 26 August includes performances of works composed by Brian Irvine and eagleowl and friends. When I first encountered Sarah’s magnificent piece I was struck by its gentleness; its vulnerability, its reliance on the efforts and attention of others to live and speak. Like a giant mechanical wheezing sage it has a kind of wisdom that reminds us of ourselves. It wants to breathe and in its voice is the sound of time, acceptance and ritual. Brian Irvine is Northern Irish composer whose body of work reflects an obsessive love of music creation in all its forms. It includes operas, orchestral works, large-scale community oratorios, film and dance scores as well as numerous ensemble, solo, chamber pieces. Together with his own 12-piece ensemble (BBC Radio 3 music award winners) he has toured extensively throughout the world. For the last four years he has been the Associate Composer with the Ulster Orchestra in Belfast and is currently Visiting Professor of Creative Arts at the University of Ulster. 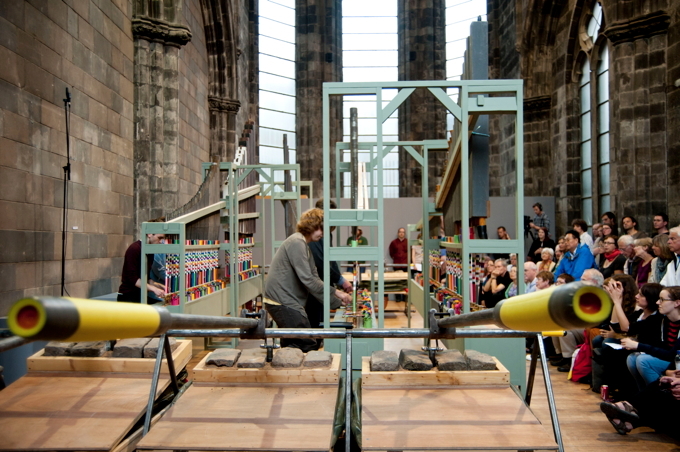 eagleowl and friends performing on Sarah Kenchington’s Wind Pipes for Edinburgh, a 2013 Edinburgh Art Festival commission. Photo: Kat Gollock. Having honed their craft over the last 8 years, slowcore miserabilists eagleowl released their critically acclaimed debut album this silent year on Fence Records earlier in the year. For this project they will be collaborating with friends from other Edinburgh acts including Broken Records, Meursault and Nap Sholty. This concert is from 7-8:30pm on 26 August at Trinity Apse, Chalmers Close, 42 High St, EH1 1SS. Tickets are £7.50. Here’s a clip of composer Daniel Padden performing part of his composition for the instrument earlier this month. Filmed by Daniel Warren.